PCG Research, a division of PCG Companies, provides in-depth product research services to the automotive community. Its latest report describes the evolution of direct marketing in the automotive industry, from segment marketing in the 1990s through to the analytics-driven, micro-targeted campaigns of today. It explains how Outsell’s platform, with analytics at its core, is helping auto dealers improve marketing campaign relevance and leverage new channels such as social media to forge stronger relationships with customers. The report also walks through Outsell’s key features, campaign building tools and reports. Outsell Social Ads: Social Ads helps dealers reach the unreachable in their database, attract new buyers to their store, and keep active in-market shoppers engaged with relevant, eye-catching ads on the world’s most popular social platform – Facebook. Single Consumer View: Outsell’s platform now offers a way for dealers to view everything they know about a customer in one place – not just name and contact info, but current vehicle, service and sales history, and engagement with past marketing campaigns. Automated Review Solicitation: 70 percent of car buyers are influenced by online dealership reviews. Outsell Reputation Management, an add-on to the platform, now gives dealers the ability to automatically request reviews from customers, and guide them through the process of posting those reviews. CDK Integration: CDK is a popular Dealer Management System (DMS) used by many Outsell Outsell has been accepted as a CDK integration partner and is working on a certified integration with CDK, ensuring quick, simple and secure connections and data sharing. 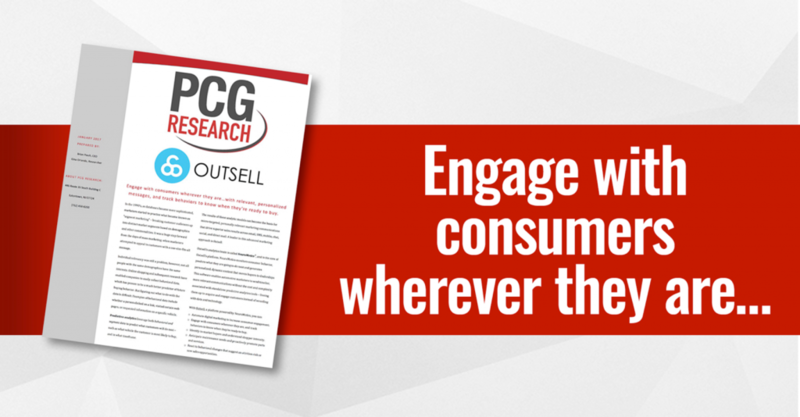 For a copy of the new PCG Research report on Outsell, visit http://www.pcgresearch.com/outsell/.